Back in 2005 this book had it’s first printing. The hardback edition of the book contains 288 pages of stories, illustrations, anecdotes, instructions, and data. Many of the cartridges covered in the book include a dimensioned drawing. Foreword by Wayne van Zwoll. The first edition if now sold out, making the book out of print. The price of the print copies of the book have already begun to rise in price. No reprint is planned, so recently Fred Zeglin decided to release the book through Amazon as a Kindle book. Wildcatting has been around almost as long as the metallic cartridge case. Wildcats have an air of mystery about them, no effort is made in these pages to diminish that mystique. Yet, you will find information here that is simply not available anywhere else. P.O. Ackley was the last Gunsmith to address the subject of wildcatting in depth. 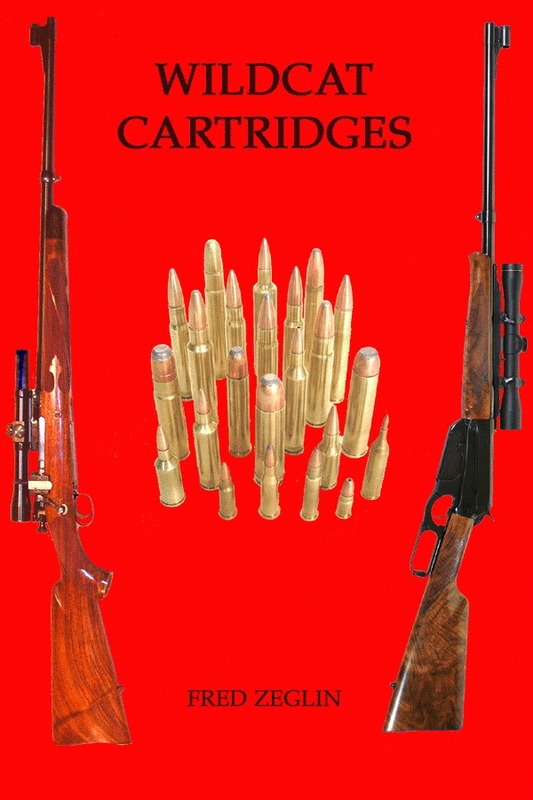 Over forty years later, Fred Zeglin, Master Rifle Builder and wildcatter has assembled in an easy to read, often humorous manual for anyone who loves guns, reloading, or wildcat cartridges. History of wildcat cartridges is presented including many well known designers like P.O. Ackley, Jerry Gebby, and Charles Newton. 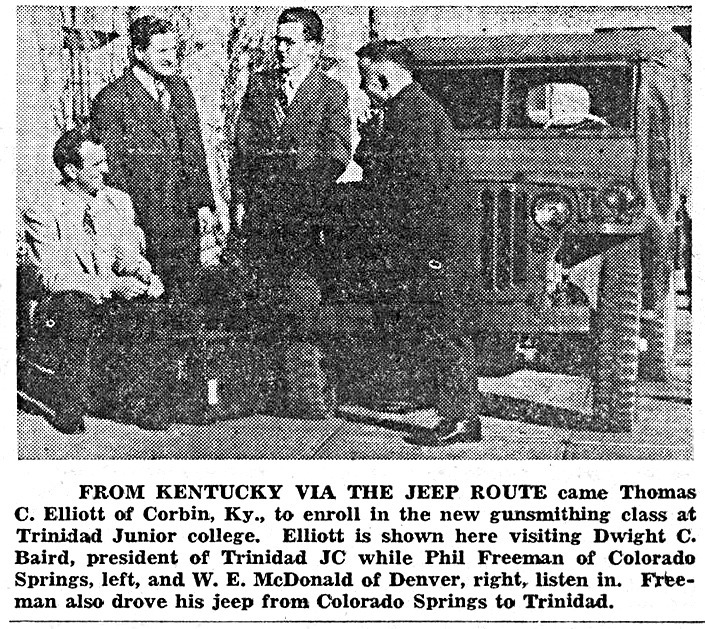 The historical information provides an appropriate frame of reference for wildcatting. Nobody really wants to repeat something that has already been done. More recent wildcats are included along with reloading data and dimensions wherever possible. Most valuable of all is the how-to information about making reamers and reloading dies. Fred supplies dimensions and instructions on how they are used to produce highly accurate reloading dies and chambers. Delivery times for such custom tools can delay a wildcat project by many months, knowing how to make your own dies can speed delivery of custom projects by many months. Click here to go to Amazon.com and check it out. Fred Zeglin wrote another book about, “P.O. Ackley, America’s Gunsmith”. If your interested in wildcats then this book will definitely be a good read for you. 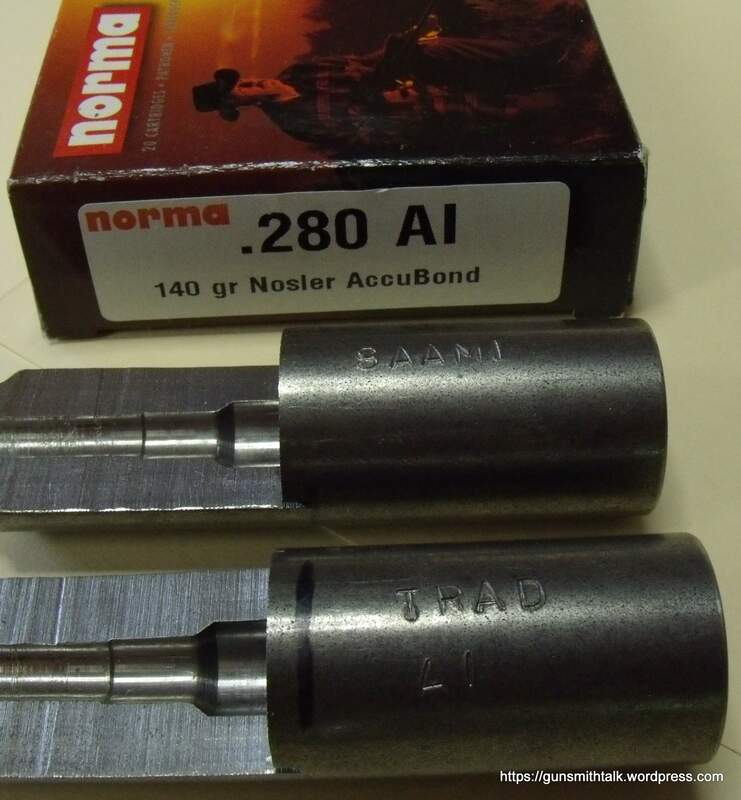 Top is SAAMI or Nosler type headspace gauge for 280 AI. Bottom is the “Traditional” headspace gauge for the 280 Ackley Improved, note the difference between the shoulder angles. 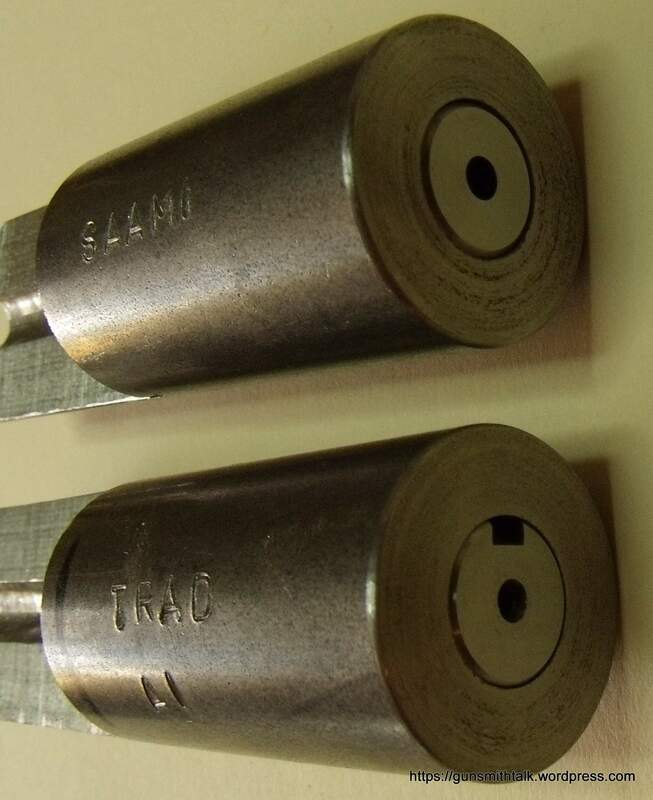 These Chamber gauges were made using the headspace gauges as marked. The purpose being that we can visually see the difference and measure any difference when the gauges are swapped, or ammunition is checked. Here the gauges have been swapped to the incorrect chambers. NOTE: no difference in headspace, both gauges are flush with the base of the chamber gauge. According to the argument, The case in the “Traditional” chamber should be .014″ too deep in the chamber. As with the gauges headspace is zero. The discussion of headspace and the 280 Ackley Improved has been going on far too long. Recently I decided to perform a test that would demonstrate the differences or similarities between the SAAMI (Nosler) gauge and the “Traditional” Ackley gauge. First you can see that the shoulder angle is not the same. The SAAMI gauge is 40 degrees like the factory brass and ammunition. The Traditional gauge is 17 degree 30 minute just like the original 280 Remington gauge and factory 280 Remington ammunition or brass. 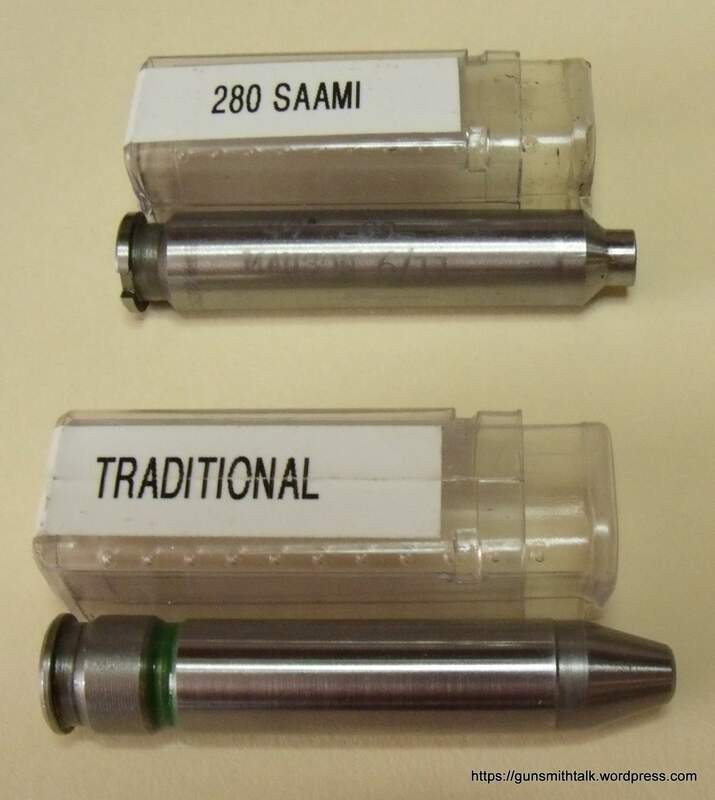 The Chamber gauges pictured below were both made with the exact same 280 AI reamer. The only difference between the SAAMI and the Traditional chambers are the headspace gauges, all other measurements are identical. Each chamber gauge was stamped with the name of the gauge used to headspace it. The headspace was set to zero, or flush with the flat base of the gauge. Once I had both chambers cut I swapped the gauges expecting to see some obvious disparity as the reamer makers have been emphatic that there is a difference. However, there was no difference between the two chambers. Well, when you check the drawings from SAAMI and the Traditional drawings for the Ackley Improved you find that indeed there is a numerical difference between the two drawings of .014″. The problem stems from reamer makers applying a datum line to the Traditional Ackley drawing at the .375″ diameter on the shoulder, this is not where the datum line is on a traditional Ackley. The drawing calls for a 40 degree shoulder, but the datum measurement is based on the traditional 17 degree gauge. In other words the systems of measuring are mixed. Ackley used the junction of the neck and shoulder to headspace his Improved chamber, not the datum line along the shoulder. Hence we end up with a headspace length of 2.1542″ on the Traditional drawing. I measured this length on my cutaway chamber and guess what, that is the length to the junction of the neck and shoulder. Thus headspace matches the drawings correctly. The 40 degree SAAMI gauges are made to the industry standard, datum line method. 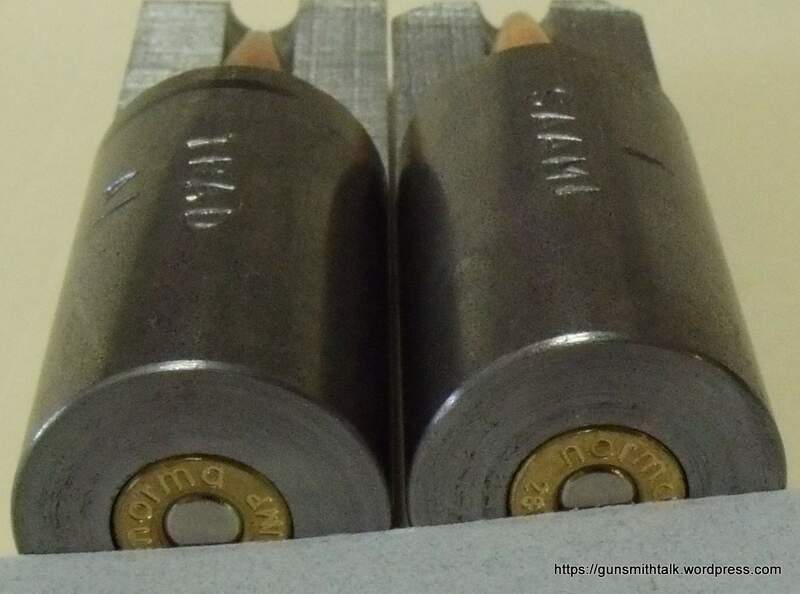 So the drawings are correct, the datum line is at the .375″ diameter along the shoulder. The length called out for this gauge is 2.140″, which appears to be .014″ shorter than the Traditional design. What we have is two different methods of measurement. However they achieve the exact same result. Seeing is believing. With all that said, for liability reasons I would still use the gauge the client asks for. It’s easier than explaining all this over and over again. The obvious question will come up, “But I am still having trouble with headspace, so the Nosler brass must be wrong?” The answer is; More than likely a lazy or inexperienced gunsmith did not use a gauge to set headspace, but rather used brass. The Nosler brass should work in a “Traditioinal” chamber if the headspace was set between a go and no-go as prescribed by P.O. Ackley and every reamer maker that sells these tools. FVCC’s Continuing Education department has announced the addition of gunsmithing courses to their offerings. During July of 2012 seven new courses will be offered to hobby gunsmiths and professionals alike. Brandon Miller, Coordinator for the new Gunsmithing courses was the NRA Coordinator for Murray State College as well as a gunsmithing instructor, until his move to the Kalispell area in 2011. Two armorers courses are being offered and are in the process of accreditation via POST. The first is an AR-15, AR-10 Armorers Course. This five day (40 hour) course is to familiarize the student with the AR-15/AR-10 weapons format. Instruction will include function, disassembly, as well as reassembly, of main and sub groups. Troubleshooting and function testing tips, tool use and the installation of many aftermarket custom parts. Optional caliber choices in the AR-15 format will be addressed. The AR-10 and various manufacturers will be discussed, with particular attention to compatibility of parts. Students should to bring their own firearms as guns will not be provided. Second, a five day (40 hour) course will focus on design, function and repair to factory service specifications for shotguns, including the study of feeding, loading, extraction, headspace, gas systems and basic repair and maintenance of all parts. Guns covered will be Benelli M1, Remington 870, Remington 1100, Remington 11-87, Mossberg 500, Mossberg 835, etc. An exciting opportunity to learn from an American Custom Gunmakers Guild member, Lee Helgeland, the art of gunstock checkering. Tools, layout and patterns will be discussed in depth as you actually checker your own gunstock. The tips and tricks discussed can shave years off the learning curve of this artistic and functional part of stockmaking. Bring your gunstocks and tools, this is a hands on class. Fred Zeglin, Master Gunsmith, will be teaching two classes for this program. The first is his popular Wildcat Cartridge Design class. This class takes the student from a raw idea to making the tools needed to form brass and chamber a barrel for a custom cartridge design. Students will make tools in this class and walk away with a full understanding of how to safely design and test a cartridge. Fred’s second class will be Glass Bedding for rifles. This five day course will highlight stress-free bedding processes while focusing on pillar bedding. The course will discuss the intricacies of the ultra accurate bolt action field rifle on today’s market. Areas covered will be bedding, scope mounting, headspace and triggers. The student will have the opportunity to bed at least one rifle in the method he/she chooses. Methods for different actions and reasoning behind the different processes will be discussed in detail. Stock pillars will be made in class. Bring your rifle. Other classes will be Alterntive Finihses: The purpose of this class is to familiarize the student with various finishes other than hot caustic bluing. There will be an instruction and demonstration in hot water bluing treatments such as Brownells Classic Rust Blue and Dicropan IM, as well as Nitre Blue. Students will also be instructed in the use of Zinc/Manganese Parkerizing as well as the setup and application of various spray-on finishes. Students will have and opportunity to apply Parkerizing or one of the spray-on finishes to at least one firearm and possibly a second one if time allows. So, bring your projects. Finally, Color Case Hardening. The differences between color case hardening modern actions as compared to antique actions will be discussed. Participants will receive hands-on training as they color case harden various parts and/or actions. Students will need to bring their own projects.